Its 11:45 pm and we are just done with our reception party. The marriage muhurat is at 12am which means I have like 15 mins to get ready. 15 mins ! I usually take more time than that on any regular day. My MUA is super worked up, and so is the hair stylist. This is like their masterchef deadline like moment…(I am so clued on to masterchef australia these days, I couldn’t find a better example, sorry)…anyhow, you get the meaning right? I hurry back to the changing room…and I suddenly get this deadly pang of hunger. I haven’t had anything since lunch…actually, come to think about it I don’t remember having lunch either. Its crazy…I need food. There is no way I can concentrate on marriage ceremony rituals with no food in my stomach. My cousins rush to the caterer who then brings me an assortment of starters and then main course. Makeup will have to wait…I am exhausted. I cannot believe that I planned a midnight marriage ceremony. But the thing is, in both our traditions – I’m from Odisha, groom is from Uttarakhand – marriages are always post midnight. So, its not like there was any other way out. Early on, I had decided wearing the lehenga to the mandap was going to be impossible. My lehenga skirt was way too puffy, and when I tried sitting with it…the can-can kept biting my skin. So the only other alternate remaining was to wear a saree. I was buying a lot of silks to give to my relatives, when I saw this red kanjeevaram saree. I fell in love. The minute I laid my eyes on it…I knew this was the wedding saree. Every bride needs to have something red in her wedding, and this was mine. The pop of blood red with gold was shiny enough to keep the jewellery to a minimum. Mine was a lawn wedding, which meant that I couldn’t overdo my look…or I would be sweating and dying in front of the sacred fire. My look was as minimal as it gets. By the time I got ready it was 12:15am…just 15 minutes late. I think it was the best effort put forward. We couldn’t have managed before this. We walked to the mandap and thus started our midnight marriage ceremony. The whole ceremony lasted for about 4 hours…I remember leaving the venue only by 5am. I think I was devoid of any emotions at the time of coming to the mandap. No, I am not arrogant…I was tired…standing on the reception stage for close to 3.5 hours, smiling the entire time…with makeup starting 6 hours prior…it was already a long day. Ditto for the groom. I don’t think men tend to enjoy weddings as much as brides. I mean its impossible. They are almost always made to sit through and participate in the whole process. Its definitely not voluntary. Throughout the marriage rituals, I kept telling myself…whatever you feel, just smile and keep a happy face. Cameras are everywhere. But alas, that just didn’t happen. Of course, I am not sharing those pictures (yet), but I have crazy number of shots where me and the groom look like we are being tortured, yawning shots, bored shots…and some that I don’t even know what I was doing. Its quite comic actually. Luckily for us, our panditji was not a typical pandit. He kept the mood light and kept explaining what all the mantras really meant. He even engaged us in conversation by asking my groom…do you take the responsibility to cook for her whenever she wants you to, will you assure me that you will open a joint account with her…all your money is going to be hers now…you need to ask for money from her…and things like that. It was all in good humor. Every time he would ask one of these whacky questions, he would wait till my groom would yell and say yes for the crowd to hear. It was superb entertainment. And just when I thought the joke was all on him…came questions flying to me like…will you make him a cup of tea everyday when he comes home tired from work…and things like that. Can you imagine answering something like that in front of everyone? Back then, I didn’t know how to make a cup of tea…I quietly whispered to panditji, “I’ll have to first learn how to make it“. I don’t know how time went by. I could tell only when I couldn’t sit in the same position that it had been long. Some of my younger cousins were sleeping happily, others were sipping chai and coffee. Oh, what I could do to get some caffeine into my system. After sometime, the eyes started burning. I want to stay awake, afterall its my wedding…but there is only that much you can do to fight your inner system. I think both of us dozed off in between the rituals for a little while, when all we had to do was sit and the chants and sacred fire was in front of us. But that’s when the next bomb came, and believe me I was waiting for this one. You see, for both of us, the rituals were new. Most of it that is. 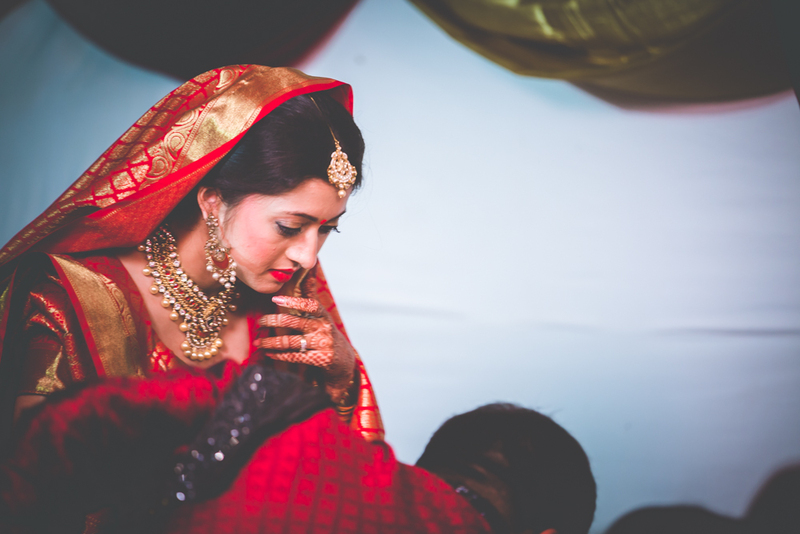 The marriage ceremony was a mix of Odia and Uttarakhand traditions…so lots of elements were a surprise. In our traditions, similar to bengalis…we have to wear a head gear…a mukut during the wedding. Its mandatory. My groom had no idea he would be made to wear one. I on the other hand was super excited. A big reason why I didn’t overdo my look was because of the mukut. Its huge and a accessory on its own. It kind of completes the brides look. The pic below captures my grooms reaction so well, I keep laughing every time I see him in this picture. Honestly, I am getting it framed. The mukut is made of cardboard with designs and colors on it. Normally, the brides mukut is smaller than the grooms. But I really wanted the big big ones, so my chachu generously bought us this pair. I absolutely love how the pictures turned out post wearing these mukuts. Its a surreal feeling to be married. I can’t express the emotions. Back then during the wedding ceremony, I locked my emotions out. One thought towards marriage and leaving my mums house…and that would have been the end of it. So I kept it light and cheerful throughout. I smiled, laughed and enjoyed with my now husband. It was the best feeling, but it had so many mixed emotions. Its something to that one has to experience. One moment I was a girl, the next I was married and instantly relations were made. I was a wife, a daughter, daughter in-law, bhabhi and many more. It was overwhelming. We had a second round of dinner post the wedding, I don’t want to share the pics after the ceremony, because we look a complete disaster. We were married now. Hand in hand we went around taking blessings from all our parents and relatives. We ate together from one plate. Our first meal as us. It was the best feeling ever. I had no clue about the time. Everyone around started rushing back. The grooms side, everyone had morning flight out and so did we. Our flight was at 9am to Kolkata. There was no time to catch some sleep.